Soundboard Cleaner-Duster is rated 4.41 out of 5 based on 87 ratings. 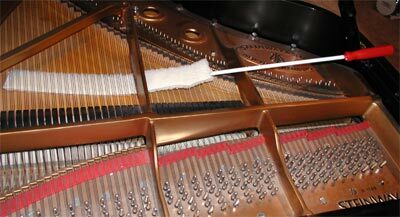 The perfect tool for removing dust and dirt from under the strings of your Grand Piano. At three-feet long, the duster provides enough length to reach all areas of the soundboard covered by the strings. The soft cushion, covering rigid plastic, both dusts and cleans with a simple sweep. You can use it wet (with a light coating of cleaner - see below) or dry. And, since the lambswool covering is removable, it's washable.